It’s time for another day of work. You hop into the car, hot coffee in hand, already running behind, and it happens. Turn the key, and click click click click click. Oh no, not the dreaded clicking noise…Come on baby, not today, not now! You try again, turning the key, praying. Click. Click. Click click click. Lifeless. We’ve all been there. We have all felt that panicky dread in our gut, sent those frantic cries for help, cursed our car for deciding to die at the worst possible moment. You’re stranded, waiting for a jump to take you to the mechanic, and wondering how much money the new battery is going to cost this time and worrying about how to pay for it. Isn’t there something we can do to stop this from ever happening again? ?Yes, in fact there is. While it’s true that all batteries will eventually need to be replaced (just like tires or windshield wipers), it doesn’t have to be a guessing game or leave you stranded when you’re caught unaware. Car battery chargers are great tools for any car owner. These can get you a jump and recharge your battery to avoid leaving you stranded, and many of them can even monitor your battery’s health so you get enough early warning to prepare for the inevitable replacement costs. 3.2 Can You Charge A Dead Battery? There are some important things to know before selecting the best car battery charger for your car. Who makes the best car battery charger? 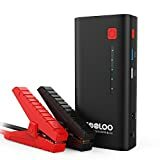 What is the best 12 volt battery charger? What is the best car battery charger based on consumer reports? In this guide, we will introduce you to the top rated automotive battery chargers based on input from the experts, comprehensive product reviews, and our own experience. We have looked into the important features, like amperage, portability, voltage compatibility, and whether it’s good for maintenance and battery health optimization. We narrowed the options down to our top 10 car battery charger brands to make your decision as easy as possible. Before we go into that, we want to put a few key details in your mind. Ask yourself whether you are looking for a way to jumpstart a dead battery or whether your focus is on long term battery maintenance. There are different chargers optimized to do these tasks. If you want something to do both, this is also possible. Next, decide how patient you are. Some of these are manual chargers that will require you to monitor the battery process over time, and some are automated and let you do other things. The trade off is that some of the more automated options also take much longer to charge. When you look at the amps and engine start, there are two things that will help you immediately narrow down our top 10 to your top few. Most people will only need between 700 milliamps and 20 amps. Jump start boosts can often require more power, and if you’re only trying to maintain batteries for cars and boats that stay idle for long periods of time, you don’t need as many amps. Engine start is a feature that works like jumper cables from a friendly stranger when you’re stranded, but without requiring that you wait for a friendly stranger to pass by. This feature isn’t necessary unless you plan to use your car battery charger as an emergency jump to prevent you from being stranded.Let’s take a look at the best auto battery chargers side by side with some of the most important features to consider. 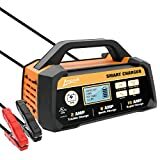 We have included an Amazon links to these because even Amazon considers them the best rated car battery chargers available. Each of these products meets the basic requirements for the average person hunting a good car battery charger. They all charge car batteries, operate within a certain ampere range, and offer some extra features. We consulted experts along with our own research and ensured that no matter which of these you choose, it will be one of the best car battery chargers for a dead battery. We have also vetted each of these options for safety features. All of these car battery chargers offer some form of safety protection. They will offer reverse polarity protection to prevent sparking and electrocution if you accidentally connect chargers to the wrong side of the battery. All of these batteries are able to charge your car well; otherwise, they wouldn’t be on the list. From here, it comes down to which of these is the best battery charger for your car specifically. Everyone wants one of these for a different reason, and a myriad of things can factor into individual efficiency, including climate and car model. Let’s go a little deeper into each product. In this guide, you will discover what gives each of these chargers a spot on our list of the best automotive battery chargers on the market today. Hopefully, knowing what each of these does best will narrow your search down even more! The NOCO Genius charges both 6 and 12 volt batteries. We have focused on the 3500 model here, but this is a consistent choice among experts as one of the best car battery brands because the model comes in a wide range of amperes, so if you don’t need 3.5 amps you can go as low a .75 or as high as 26 amperes. The 15 and 26 amp models can even jump start a completely dead car. What sets this battery charger apart is its versatility. Not only does it have a wide range of amperes, it can also be used on both 6 and 12 volt batteries, including wet cell (flooded), gel cell, calcium, lead acid and lithium ion batteries. Not only can it function well for car batteries, it can also be used on marine, power sport, and lawn equipment. This charger also features active monitoring systems that let you know how your battery’s overall health is looking and work to repair damage from discharge and sulfate to lengthen and optimize battery life. The battery charger includes charger, clamps with integrated eyelet terminals, a user manual, and even comes with a 5 year warranty. The Battery Tender Plus is an extremely friendly option. This simply and intuitive design is easy to use, even for those of us who know next to nothing about cars and aren’t mechanics. Following suit with the ease of use, it features a ton of built-in safety features to protect against accidents, including spark protection. It will automatically shut off when the battery reaches capacity to avoid overcharging. When this happens, it automatically switches to maintenance mode and will recharge as needed when your disused battery begins to lose charge. The Stanley BC25BS can charge even a diesel truck in under 5 hours. It can start a dead engine in under 2 minutes to get you on the road quicker than other chargers. Speed is one of the primary features of this battery charger. This charger also reconditions your battery during use by repairing the sulfate buildup that forms on battery plates to ensure longevity. The one-touch automatic charging, intuitive power sensing, and LED screen make it easy to use. This model is very user friendly. It’s got a lot of features that are laid out on a clean, easy-to-understand interface. 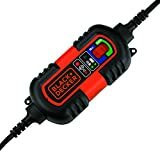 Instead of a user having to choose the charging mode, the Black and Decker BC 15 BD intuitively reads the current charge and determines the right amperage to send to the battery. This also features a repair mode that reduces the buildup of solids on the battery to extend longevity. Diagnostics will also help alert you when your alternator is misbehaving so that you can easily distinguish and self diagnose car battery problems and prevent things from getting worse, leading to expensive repairs. There are reports that sometimes the product is dead on arrival. Make sure it works as soon as you receive it. Some reports of quality control issues – Be sure to immediately check that this works. The CTEK company specializes in car batteries and chargers. They focus on three things: safety, simplicity, and flexibility. Perhaps this is why they are the “fan favorite” of this list. They have the highest consumer rating across all sites, come with the most referrals as an expert choice, and have the most vocal supporters who swear by their products. Most people who purchase a CTEK product continue to purchase within the CTEK family of products for the rest of their needs. This product uses several safety features. They include reverse polarity protection, spark free systems, and even a protection to prevent the battery or charger from short circuit issues. It is also safe to use in any conditions, from -4 to 122 degrees Fahrenheit. It is dustproof, weatherproof, and shockproof. The CTEK charger maintains battery life. It detects and eliminates sulfur buildup to ensure longevity. It actively monitors battery health and notifies of minor maintenance needs to prevent major problems from arising. A unique feature of this charger is a low ripple advantage. Any time an electrical current produces 5% or more ripple current, it has a negative effect on the battery’s positive electrode and can even damage sensitive technology in the vehicle. CTEK ensures that all of its chargers maintain lower than 5% ripples. 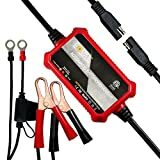 I was skeptical about the Motopower charger because of its extremely low price compared to other models, but I decided to give it a shot and see if it was worth trading some features for affordability. I was pleasantly surprised! It is important to keep in mind that this is a budget-friendly model. It will not have all of the bells and whistles that come with the other products on this list, but it will also come at less than half the price of most other models. 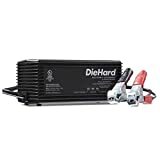 If you don’t need a rush job and are willing to surrender your control over when it uses which mode, this is definitely the best value car battery charger on our list. It will charge your battery just as well as the other chargers; you’ll just have to wait longer for the charge. This is a pretty cool piece of technology for those of you who want to do your part to reduce your carbon footprint and save the environment. This car battery charger relies entirely on solar power to maintain battery strength. You can suction cup this small solar panel directly to your car then power it up using either gorilla clips or by plugging it into your cigarette lighter. This model can maintain the battery life of 12 volt car batteries while on the go, thanks to the small panel and ability to plug directly into your cigarette lighter. The Optima is a great purchase for reviving dead batteries. In fact, it can revive batteries that have been discharged for lower than 1.25 volts. This feature really makes it stand out from the crowd. It features an easy-to-use, intuitive design. An LED battery gauge will show battery health while an LCD screen and quick set options allow 1-touch use. Of course, this also comes fully loaded with standard safety features to protect users. We also love the easy storage wall organizer. This is a great option for travelers. It is small enough to fit right into your car’s glove compartment but powerful enough to jump start your car 20 times with a single use. It offers a compass and LED flashlight in case you get stuck and even offers a flashing SOS emergency light. The USB port allows you to charge your cell phone so it can be used in emergencies. In fact, it also has a red light to warn oncoming traffic that you’re stuck, increasing your visibility to keep you safe. That being said, with this charger you should never be stuck for long. This is more than just a car battery charger – it’s an entire jump start kit for your car. The reason I love this so much is that it is multi-functional and portable. Most jumps require another car or a massive kit that requires you to be near a wall charger or takes up tons of space, making it not at all portable or friendly for use outside of a garage. This one is perfect for anyone who is on the go! Schumacher is consistently ranked among the top 10 car battery brands, so we tried out a few of their charger models, and this one made our list. It features a car start jump that allows you to jump start a car for use and long term battery maintenance. Intuitive sensors tell it which charging mode to use – trickle, maintain, or charge. It also diagnoses both the battery and alternator to let you know of any problems. This is the only product on the list that does not have a single negative review. Seriously, we looked. Everyone loves this product, and no one has anything bad to say about it. We’d call it the fan favorite, but it’s just the plain favorite. When looking at a list of features, it can sometimes help with the basics but not the comparison. If all of these are great options, how do you narrow down from the top 10 car battery charger brands to the best auto battery charger from the list? Decide which features matter to you. If you’re like me, you won’t know what things like car start and active monitoring really are. What really puzzled me was reverse polarity protection. We know that batteries come with positive and negative sides, but we didn’t think it was possible to reverse these without magnets or that it might be desirable to reverse them at all. We needed to look into what, exactly, these features meant. The good news is that because we did the research, you won’t have to! Everything you need to know about these features is listed here. What are amperes, and how many of them do you need? What’s the difference between voltage? What are the features that need to come standard, and which ones are just fancy additions? We’ve broken down the most common features offered by the best rated car battery chargers, so you know exactly what they mean. Knowing your reason for buying a charger can help you decide which ones are better suited for your needs and which features can be sacrificed to save your budget. We have endeavored to answer a few of the most frequently asked questions in this section. After all, if you are wondering how these work and what they’re designed to do, you won’t want to be bombarded with features. Once we answer a couple common questions, We’ll walk you through some of the common language regarding car battery chargers and what you need to know. Before we talk about the features, it’s important to touch on how to use this product. Dealing with electricity can be scary and dangerous when it isn’t done properly. While this list maintained a minimum safety standard that should prevent the worst injuries, we don’t want any at all. These chargers work by lining cables up with your battery and letting electrical current flow through them. Here are some of the basics you need to know to operate them. First and foremost, do not plug your charger in or turn it on as your first step. It is important to connect it before allowing the current through, otherwise you may end up with electrical sparks flying from the cables, and that’s a fire hazard. The biggest question most people have is what clamps to what? In this case, it is important to remember to THINK. Because great minds…THINK ALIKE. If you keep that phrase in mind, it will be much easier for you to remember that you want to match positive with positive and negative with negative. Why? Because great minds think ALIKE. Now, you can turn the charger on and start charging. For intuitive chargers, this should be all you need to do. If your charger has manually input settings, follow individual instructions to tell it what voltage your battery is and how much charge you need. Important Safety Tip: Do not touch or move the cables during the charging process! Cut the power before attempting to make adjustments or remove the cables. Once your battery is finished charging and you have turned the power off, it is safe to remove the chargers. Your battery should be ready to go. Can You Charge A Dead Battery? This isn’t an easy question to answer, but it is a common one. The question to ask when determining the answer is how the battery died in the first place. If the battery just went a really long time between uses, or you forgot to turn your headlights off all day, then most likely the answer is yes, with enough amperes and time, you can recharge. 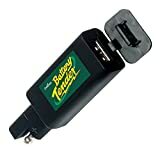 We included a car battery charger on our list that is exceptional at charging dead batteries, even those who have discharged down below 2 volts. The unfortunate truth is that all batteries do have a predetermined lifespan. While proper maintenance can optimize longevity, the battery will eventually die. If your battery died again after multiple recharges, and this isn’t the first time it happened, then unfortunately, you will likely need to replace the battery, and even purchasing a battery charger wont save it. Battery chargers come in a wide range of sizes. Some of them are extremely portable but will take a while to charge and be unable to jump start a completely dead battery. Others are extremely powerful and include jump start capability but are equally heavy beasts that will take up half your trunk space if you decide to keep it in your car. One of the features that all of these choices have in common is reverse polarity protection. This is a safety feature that prevents electrocution or sparks from flying if you accidentally connect the cables to the wrong end of the battery. These chargers come in a variety of amperes. The range determines capability. It’s important to know what your primary use will be for the charger. Lower amperes will take longer to charge your battery, but trickle charging makes maintenance a breeze. These are great options if you don’t use a car very often but want to be sure the battery won’t go dead when it is left idle for too long. Higher ampere options will cost more, but they are better options for protection against battery deaths and will prevent you from being stranded. Many of the higher ampere products can jump start a dead battery to get you on the road again without having to wait for charges. Even those that don’t jump start a dead battery immediately will take significantly less time to charge dead batteries than lower ampere models. For most purposes, an amp range between 750 milliamps to 20 amps should be more than sufficient. More power isn’t requires unless you’re looking for a way to jump start your car, and any less power will take a really long time to charge your battery and may not be able to maintain it optimally. This feature is not as common among different models. It will cost more to purchase a battery charger with the ability to start your car, because it takes a lot more power. If you want the reassurance that you won’t be stranded f your battery dies while you’re out, then this is a nice feature. This feature is standard among most low ampere chargers, and we would not recommend buying a product that didn’t include it. Active monitoring allows a charger to tell you about your battery. The lower ampere models will use it to determine when an unused battery starts losing charge. It will activate the battery to allow it to begin charging, then switch back off to prevent overcharging when it notices the battery is fully charged. More comprehensive chargers have more informative active monitoring. Many of these chargers can give you detailed information about your car battery’s health. They will warn you when it is permanently losing life, let you know how much charge you’ve got in it, and even safeguard against common battery killers to lengthen your car battery’s lifespan. The battery chargers on this list frequently include repair modes. The idea behind chargers is that users want a way to extend their battery life and recharge from home without expensive trips to the mechanic. This is why we consider a repair mode to be an essential feature of any car battery charger. This feature reduces buildup to prolong battery life. Know your car’s battery voltage. Different chargers are optimized for different voltage batteries. Most car batteries are 12 volts, so all of the chargers on this list are compatible with 12 volt batteries. Many of them are also compatible with the 6 volt batteries commonly found in golf carts, sports vehicles, and motor sport vehicles. Be sure to get a charger that is compatible with your voltage. A few of the ones on this list are versatile enough to cover several battery types. Absorbent glass mat (AGM) is a feature commonly found among the newer car battery chargers. Older cars won’t need to worry about this feature, but if you have a brand new model, it may have an AGM battery. This new battery type works the same way, but instead of having liquid interiors, these chemicals are stored in glass sheets. These are most commonly found in motorcycles and new model luxury cars. Looking at your battery will tell you what type you have. Most batteries are flooded lead acid (FLM), AGM , or Gel (gel-filled) batteries. Make sure that your charger is compatible with your battery type. This can be a pricey purchase. It isn’t necessarily going to be used right away, and issues won’t show up immediately if you are purchasing it as a backup in case of emergency. Because of this, you’ll want to know the warranty coverage. Most of these come with a 5-year standard warranty. Some of them cover even more time. Along with the warranty, be sure to check into the company. A warranty is useless if the company’s customer service is nonexistent. Also, many companies require you to pay for shipping the faulty product back to them for repairs. On such a heavy item, the lower-end models can often cost nearly as much to redeem warranties than just buying a new one, and the process will take much longer. Choosing the right car battery charger is a pretty complicated decision. There are a lot of different factors that determine which battery charger is best for your needs, and there is not a single right answer for every car battery. We sincerely hope this guide has helped you to find the best car battery charger for your needs. After this, you should know what each feature does and how much power you will need for the job you want this charger to do. You should now be confident that you can make the right decision and have a couple of options that have been vetted and chosen as the best on the market.